For other uses, see Respirator. OR personnel wearing surgical mask at California Pacific Medical Center. A surgical mask, also known as a procedure mask, is intended to be worn by health professionals during surgery and during nursing to catch the bacteria shed in liquid droplets and aerosols from the wearer's mouth and nose. They are not designed to protect the wearer from inhaling airborne bacteria or virus particles and are less effective than respirators, such as N95 or NIOSH masks, which provide better protection due to their material, shape and tight seal. Surgical masks are popularly worn by the general public in East Asian countries to reduce the chance of spreading airborne diseases. A surgical mask, or procedure mask, is intended to be worn by health professionals during surgery and certain health care procedures to catch microorganisms shed in liquid droplets and aerosols from the wearer's mouth and nose. Its first recorded use was by the French surgeon Paul Berger during an 1897 operation in Paris. Modern surgical masks are made from paper or other non-woven material and should be discarded after each use. A surgical mask is not to be confused with a respirator and is not certified as such. Surgical masks are not designed to protect the wearer from inhaling airborne bacteria or virus particles and are less effective than respirators, which are designed for this purpose. A Kimberly-Clark procedure mask. Note the full facial shielding and the Droplet Isolation protocol signage. Simple surgical masks protect wearers from being splashed in the mouth with body fluids, and prevent transmission of body fluids from the wearer to others, e.g. the patient. They also remind wearers not to touch their mouth or nose, which could otherwise transfer viruses and bacteria after having touched a contaminated surface (fomite). They can also reduce the spread of infectious liquid droplets (carrying bacteria or viruses) that are created when the wearer coughs or sneezes. There is no clear evidence that disposable face masks worn by members of the surgical team would reduce the risk of wound infections after clean surgical procedures. 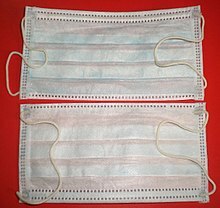 Cotton and gauze masks do not serve as surgical masks as they do not offer adequate filtration of microbes. Evidence supports the effectiveness of surgical masks in reducing the risk of infection among other healthcare workers and in the community. In community settings, facemasks must be coupled with other measures such as avoiding close contact and maintaining good hand hygiene to reduce the risk of getting influenza according to the Centers for Disease Control and Prevention in its guidance regarding the 2009 swine flu outbreak. For healthcare workers, safety guidelines recommend the wearing of a face-fit tested respirator mask conforming to United States standard NIOSH N95 or European standard EN 149 FFP3 in the vicinity of pandemic-flu patients, to reduce the exposure of the wearer to potentially infectious aerosols and airborne liquid droplets. The U.S Centers for Disease Control and Prevention (CDC) provides information on manufacturers' products, and the importance of correct fitting of such masks (respirators). A printable factsheet has been designed for issue to those unaccustomed to respirator use. A man wearing a surgical mask in public in Japan. During the 1918 flu pandemic, a street car conductor in Seattle, USA refuses a person who attempts to board without wearing a mask. Surgical masks are popularly worn by the general public in East Asian countries to reduce the chance of spreading airborne diseases; in Japan, it is common to wear a face mask whilst ill to avoid infecting others in public settings. In Japan and Taiwan, it is common to see these masks worn while ill, as a show of consideration for others and social responsibility. Surgical masks were widely used in China, Hong Kong, Vietnam, and Toronto, Ontario, Canada during outbreaks of the SARS, during the 2007 bird flu pandemic in Japan, and during the 2009 flu pandemic featuring swine flu and the H1N1 virus in the United States and Mexico City. Typical 3-ply surgical masks. The top one has the right side up and the bottom one up side down. The edge with double stitches is designed to cover the nose, and a metal wire is concealed within so the mask could be fitted to the contour of the nasal bridge. The design of the surgical masks depends on the mode; usually the masks are 3 ply/3 layers. This 3 ply material is made up from a melt-blown material placed between non-woven fabric. The melt-blown material acts as the filter that stops microbes from entering or exiting the mask. Most surgical masks feature pleats or folds. Commonly, 3 pleats are used allowing the user to expand the mask so it covers the area from the nose to the chin. There are 3 different ways to secure the masks. The most popular is the ear loop, where a string like material is attached to the mask and placed behind the ears. The other is the tie-on and the head band. The tie-on straps consist of four non-woven straps that are tied behind the head. The head band is an elastic strap that is placed behind the head. Surgical masks with decorative designs are popular in countries in which they are worn in public. ^ a b "Interim Recommendations for Facemask and Respirator Use to Reduce Novel Influenza A (H1N1) Virus Transmission". Centers for Disease Control and Prevention. May 27, 2009. Unless otherwise specified, the term "facemasks" refers to disposable facemasks cleared by the U.S. Food and Drug Administration (FDA) for use as medical devices. This includes facemasks labeled as surgical, dental, medical procedure, isolation, or laser masks... Facemasks should be used once and then thrown away in the trash. ^ "Respiratory Protection Against Airborne Infectious Agents for Health Care Workers: Do surgical masks protect workers?" (OSH Answers Fact Sheets). Canadian Centre for Occupational Health and Safety. 2017-02-28. Retrieved 2017-02-28. ^ Vincent, Marina; Edwards, Peggy (26 April 2016). "Disposable surgical face masks for preventing surgical wound infection in clean surgery". Cochrane Database of Systematic Reviews. 4: CD002929. doi:10.1002/14651858.cd002929.pub3. PMID 27115326. ^ MacIntyre, CR; Chughtai, AA (9 April 2015). "Facemasks for the prevention of infection in healthcare and community settings". BMJ (Clinical Research Ed.). 350: h694. doi:10.1136/bmj.h694. PMID 25858901. ^ "Interim guidance on planning for the use of surgical masks and respirators in health care settings during an influenza pandemic" (PDF). U.S. Department of Health & Human Services. October 2006. Archived from the original (PDF) on 2016-03-04. ^ "Working with highly pathogenic avian influenza virus". UK Health and Safety Executive. Retrieved August 2, 2014. ^ "N95 Factsheet". Centers for Disease Control and Prevention. Archived from the original on November 11, 2009. ^ Juliet Hindell (May 30, 1999). "Japan's war on germs and smells". BBC Online. ^ Negrin, Matt (2009-04-26). "For allergy and flu season, the Japanese turn to surgical masks". Winnipeg Free Press. Retrieved 2017-09-29. Wikimedia Commons has media related to Surgical masks.